In the last few weeks, we've had a water leak, a ripped up floor and baseboards, no pantry storage, and a big hole in the wall. We're currently down to just needing a new floor, new paint, and new storage. It's progress. But I've had my fair share of "I'm done" moments during this stage. They usually happen after a long day of keeping the toddler from eating all the crumbs stuck in the exposed floor glue while dealing with the 3 year old's fit every time I simply suggest that he might need to use the potty about now. Another agonizing dinner decision because I can't find anything, and another night of having to eat in the living room because there is way to much crap covering the kitchen table. And another day of fighting the horde of ants traipsing into my kitchen to get to those food crumbs before the Munchkin does. Oh yes, there have been many days where I felt my grip on sanity slipping away. I've taken out my frustration on my family. I've shed tears. I've had to take long breaths with my eyes closed. I've had to work hard to keep my voice calm. I've had to retreat to my room while Hubby watches the kids and takes care of dinner. 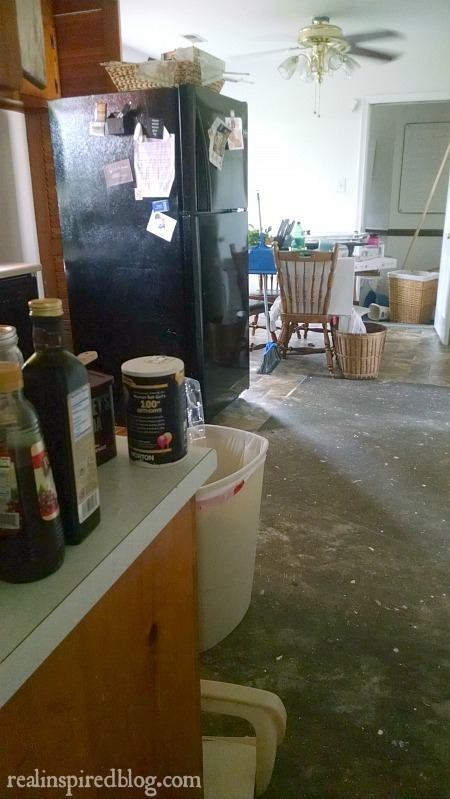 Between a messed up kitchen dumping it's contents into the adjoining rooms and two littles, it's hard not to give up. It's like holding back a tidal wave with one hand and trying to do the dishes with the other. I have to fight against throwing up my hands and just letting nature take over. Any minute that wave could come slamming past me. It's amazing how one room in an imperfect stage can have such an impact. I've had to remember that is just what it is: a stage. Stages are hard. I'm trying to embrace the imperfection and the chaos, knowing that the finished calm will be that much sweeter for putting up with it for so long. In the meantime, I'll just be over here with my paper bag.